After both practice sessions were washed out on Friday afternoon, the driver of the No. 16 AISIN Group, AW North Carolina Toyota Tundra rolled straight into the second round of qualifying and started the 200-lap event from 17th spot. Moffitt made steady progression during Stage 1 until a caution on lap 36 when he came to pit road for four tires and an air pressure adjustment for a tight balance on corner exit. Moffitt only gave up two positions for four fresh tires and restarted 16th on lap 44. At the end of Stage 1 on lap 50, Moffitt ran 14th, but stayed on track to gain track position under the caution. When the event resumed on lap 61, Moffitt restarted ninth and finished the stage in the same position, which earned him two championship points. Moffitt returned to pit road under the stage caution for another batch of four tires, fuel, and a right-rear wedge adjustment to alleviate his tight condition on throttle and corner exit. Crew chief Scott Zipadelli’s adjustments bore fruit as Moffitt wasted no time knifing through the field. He restarted ninth on lap 111 and entered the top five on lap 145. A restart on lap 160 delivered chaos among the top contenders in Turn 1 and allowed Moffitt to pick up two positions and moved into third for the subsequent restart. Moffitt restarted third on the race’s final restart on lap 168 and valiantly fought to maintain his position among the top trio. He chased down the No. 13 truck for the second position with less than 20 laps to go, and secured the runner-up spot on lap 187. 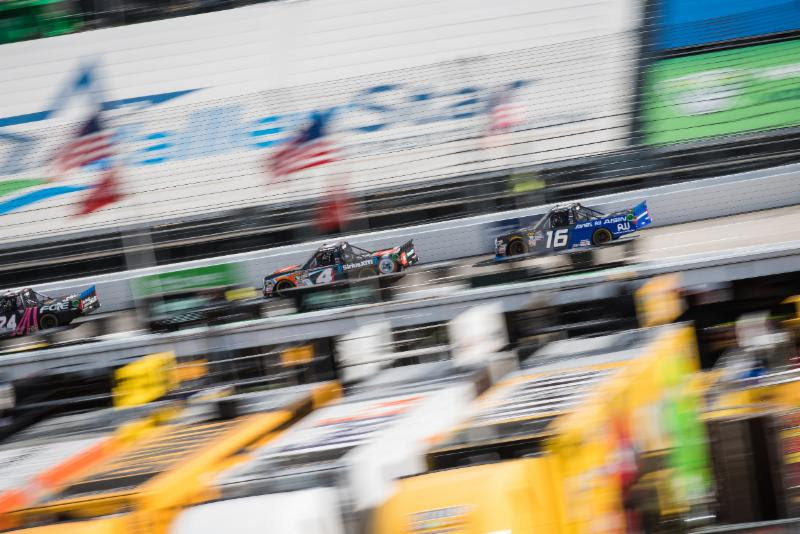 Moffitt ran out of laps to make a charge for the lead and took the checkered flag in second, his second top-five result of the NCWTS Playoffs. He and the No. 16 AISIN Group, AW North Carolina team head to Texas Motor Speedway with a 15-point cushion on the cut line.